Looks like Sam Raimi is going to land nicely with OZ: THE GREAT AND POWERFUL after his helming of the Spider-man franchise for so long. The poster looks outstanding. I like the blend of the realistic (a hot air powered balloon) and the fantastic (The Emerald City in the background), the rich colors and lighting. Beautiful. Want further testament to how gorgeous this movie is going to look? OZ is being shot in native 3D using 3ality Technica's 3D camera rigs! You can expect the best. The movie stars James Franco (Oz), Mila Kunis (Theodora), Rachel Weisz (Evanora), Michelle Williams (Glinda) and Zach Braff (Finley). Be prepared for an avalanche of marketing with Comic-Con coming up next week! 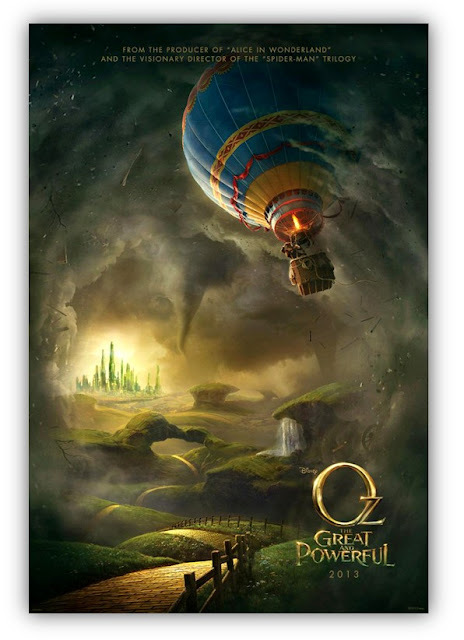 OZ: THE GREAT A POWERFUL opens March 8, 2013.